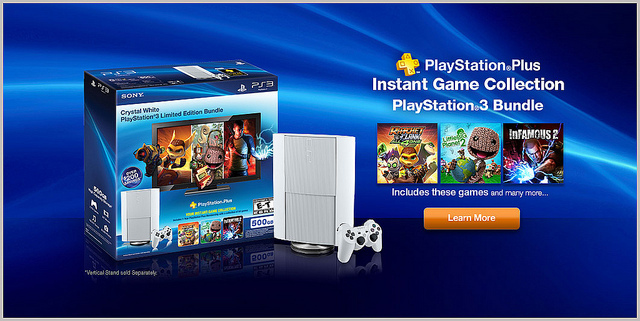 Sony has revealed a new PlayStation 3 system bundle today. At the center of the package is a limited edition Crystal White PlayStation 3 slim unit, being released for the first time in North America due to popular demand. Also included is one year of PS Plus, Sony’s premium service which has come into its own over the past couple of years. PS Plus gives players access to a dozen PlayStation 3 games, including InFAMOUS 2, LittleBigPlanet 2, and Ratchet & Clank: All 4 One, and more titles are added to the program each month. Additionally, owners of the PlayStation Vita will receive another six titles for free. The Crystal White PlayStation 3 bundle will hit store shelves on January 27th, with an MSRP of $299.99.